LARGE Unframed 56" x 69"/ Large Framed 71" x 84" Editions of 12 STANDARD Unframed 37" x 45"/ Standard Framed 52" x 60" Editions of 12 Alaska, USA, 2015 I am very examining of my work and rarely get too enthused with what I take – the threshold of what transcends is very high. 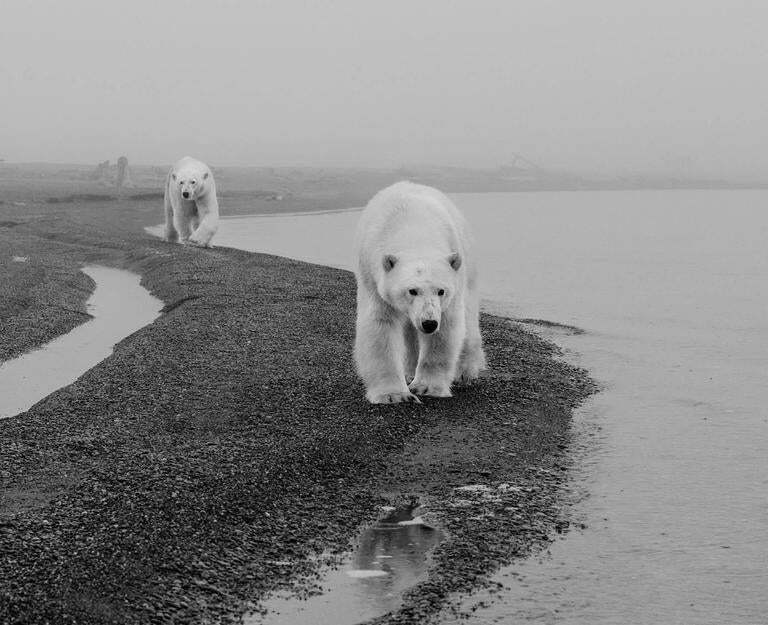 However, I don’t think I have ever seen a picture of polar bears like this. It has a sense of place lent to it by the fog and the arctic debris in the background, whilst the narrative speaks of a journey and togetherness. The acclaimed series Game of Thrones, has won many accolades for allowing fantasy to become reality in our subconscious minds. This was reality. It is a photographer’s photograph – by which I mean that other photographers home in on this image and can look at it for some time. The image crop was very limited because my instincts were to include the small reflection in the puddle ahead of the lead polar bear – that in itself gives a clue as to just how close I actually was.